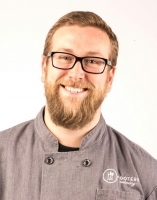 Jason Sutton has been with the Footers family almost 5 years and is actively running their culinary department as the Executive Logistics Chef. His previous work as a Butcher and Chef in Chicago and Maui, Hawaii has leant him an incredibly versatile knowledge of flavors and styles. Jason's unwavering upbeat personality keeps their culinary team one of the best places to cook in Colorado.